In a large pot over medium heat, melt the butter and marshmallows together. Pour the chocolate Cheerioes into the melted marshmallow mixture. Press into a 8x8 pan greased with nonstick baking spray. Allow cereal treats to cool and harden slightly. Remove from pan and cut cereal treats in half, then slice into 8 triangles. Place yellow candy melts in a large plastic bag. Microwave just until melted. Press the melted candy melts into the corner of the bag. Dip the top triangle of each cereal treat into the candy melt, covering the bottom 1/3 of the cereal treat. Place orange candy melts in a large plastic bag. Microwave just until melted. Press the melted candy melts into the corner of the bag. Dip the bottom of the cereal treat into the candy melt, gently sliding the cereal bar around to completely coat the bottom 2/3 with orange candy melt. Melt the white candy melts, dip the top tip of each cereal treat into the candy melt. Place cereal treats on a parchment lined baking sheet. Allow to harden before serving. 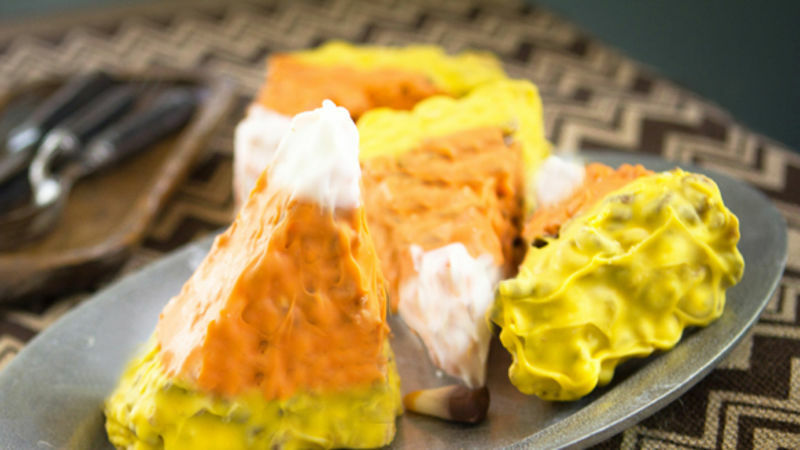 Ready to turn the classic Halloween candy into the sweetest treat on the block? Stay tuned -- we'll show you how to make these adorable chocolatey cereal bars (using Chocolate Cheerios or Count Chocula!) into deliciously big candy-corn shaped treats. They're perfect for any occasion that needs a little kiss of candy corn! Start with a few simple ingredients. We nabbed Chocolate Cheerios for this recipe, but the time for Count Chocula is nigh. Try mixing this yummy treat together with the ol' Count for even more seasonal fun! Marshmallows, a bit of butter, chocolate cereal and you've got yourself a batch of cereal treats. Press them into an 8x8-inch pan coated with nonstick baking spray. Once the cereal has set (about 5-10 minutes in the fridge will speed up this part of the process), run a knife along the edges of the pan, and loosen it from the pan. Slice the cereal treats into 8 triangles. Dip the bottom of the cereal treat into yellow candy melts. Never used candy melts before? You can find them in plastic bags in the cake décor section of most craft stores. Here's my little secret for easy candy corn décor: Plastic bags! Simply pop your candy melts into large plastic bags and microwave in 30-second bursts until melted. You can then easily press the candy melts all the way to the bottom of the bag for dipping, or move the edges of the bag around to ensure the whole cereal treat is covered with the candy melts. Orange candy melts cover the bottom 2/3 of the cereal treat. Finish it all off with a tip of white candy melt, then allow your cereal treats to firm up. Wrap in individual food-safe plastic bags. Or serve immediately! Candy corn has never been so fun to munch on!